Wooden worktops are an extremely popular choice for many people today. There are a whole host of benefits associated with selecting this option for your kitchen. First and foremost, these worktops are cost effective and long lasting. In addition to this, wood is extremely stylish and has a quality to it which is timeless; meaning that it is unlikely to ever be deemed unfashionable. Another reason why people tend to like wood worktops is because of the vast range of choice available. There is a style of wood to suit all tastes, all budgets and all kitchen styles. Therefore you are bound to find something which replicates what you are looking for. In order to give you some ideas and inspiration this article will reveal the top five choices of wooden worktops available on stores and off of the internet today. One of the most widely utilised choices is that of bamboo worktops. Bamboo is one of the lighter options available. It has a fresh and sunnier quality to it; something which fits into the image of a kitchen very well. Bamboo worktops are different from other worktops because they are compressed individual sections which are layered on top of each other. When your bamboo worktop is first installed it will appear quite a bit paler than what you may imagine, but don’t worry once it begins to settle it takes on a light golden appearance which is simply delightful. In addition to style, a lot of people like this option because it is hardwearing, resists bending and warping, is durable and naturally resistant to water. 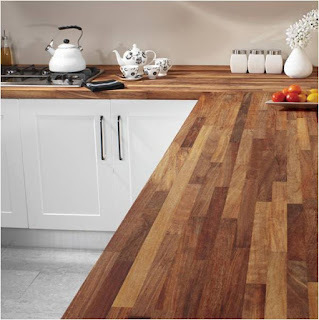 In addition to bamboo another style of wood worktops which is highly popular is iroko. This is an African type of timber which is simply stunning. In contrast to bamboo, when it is installed it appears a lot darker and then begins to lighten into a divine warm and rich brown hue. Iroko has an inviting appearance, but it is also the best worktop option to go for in terms of being hygienic. A further choice worth considering is the zebrano worktops, also known as zebrawood. The reason it is known as this is because of the distinct pattern found on the wood. The overall colour is a gorgeous gold; however what makes this option stand out from the others is the unusual dark brown grain pattern which runs through the golden wood. This is the most unique and individual style of wooden worktop that you will find on the market today. The fourth style of wooden worktop in the top five has to be cherry. If you are looking for a style which will add brightness and radiance into your kitchen then this is the option to go for. Cherry possesses vibrancy to it which you will not find in any other wood or any other material. It will give your kitchen a beautiful lift and lightness to it which is welcomed in any home. And finally, the last but certainly not least option is that of wenge wood worktops. This is one of the deepest options available; its colour is like dark chocolate. It looks luxurious and lavish and will certainly make your kitchen look like something which came straight out of a showroom. It is one of the most exclusive options available and thus will give your home that VIP edge. Moreover, it is easy to maintain and long lasting. So there you have it; the top five options in wood worktops. The only question that remains is; which one will you be buying? Author bio – Andy is a freelance journalist who specialises in home style. He likes to watch football and socialise in his spare time. He used Worktop Express is a resource for information on the different wood worktops for this article.